Click on the links to see the descriptions of the various positions. Solicit agenda items and send out an agenda a week before the meetings. Check upcoming TVTA calendar dates. Ensure enough members are coming to guarantee a quorum (50% plus one). Chair the meeting and vote in the event of a tie. Communicate needed information to absent members. 1. Attend board meetings or assign delegate in your absence. Ensure that committee leaders and Board members are coping with their duties. 3. Monitor motions passed by the Executive and the required follow-up. 4. Lead organization and planning for the AGM. 5. Write a quarterly "President’s Message" for the Trekker. Deadlines are normally 2nd Friday of Feb/May/Aug & after AGM. Contribute other articles as appropriate. 7. Review risk assessment and ensure Board makes a review of Club’s Risk Management policy. 8. Ensure adequate Training standards re: Hike Ontario requirements, First Aid training list. Monitor the Active Hike Leader list with Activities Director. 9. Sign legal agreements (2 signatures required) e.g. Fanshawe Trail access (UTRCA - May 1 - April 30) & verify volunteer work grant letters. Board members assist with committee work. They also may chair a board meeting or represent TVTA at environmental input meetings or London Environmental Network meetings. 2. Be aware of club issues and assist as necessary in order to assume President’s duties. 3. Learn as much as possible about the club operation. 4. Send an annual Thank You note for the free meeting place (Forest Lawn) and write an acknowledgement for the Trekker. 5. Assist with chairing Board meetings. 1. Attend and take minutes at board meetings in accordance with "Robert’s Rules of Order". Find an alternate if unable to attend a meeting. 2. Attend and take minutes at the AGM. 3. Collect the year-end directors’ reports and the previous year’s AGM minutes. Copy and distribute them to members attending the AGM. 4. Circulate minutes by e-mail to board members approx. 2 weeks prior to a mtg. 5. Keep a record of directors’ reports for the current year. 6. Keep a record of all available past minutes and pass them on to the next secretary. 7. Keep a record of relevant TVTA correspondence. 8. Ensure lists of contact information are kept up to date. Deliver a copy to Grosvenor Lodge - Jean. 9. Schedule events for the calendar year at Forest Lawn Memorial Chapel (Normally the first Monday of each month unless a holiday, and no meetings in January and August.) ?10. Book the Annual General Meeting date (typically 2nd Thursday in November) with Grosvenor Lodge. 3. Prepare Board Meeting Report (usually the first Monday of the month) of any noteworthy financial transactions. 4. Monitor the status of charitable donations to ensure that disbursement quota requirements are met. 1. Produce a set of interim financial statements ie. Budget for board meetings. For example, for the Feb. meeting, cover the October –December period. Provide copies. 6. December – file T3010 Registered Charity Return for fiscal year ending Sept. 30th by March 31st of the following year. Failure to comply will result in revocation of the charitable registration status and no charitable receipts for income tax purposes can be issued. The annual return updates director changes, all directors are listed with date of births required. 8. December - schedule changeover of signing authority at BMO if necessary. Normally, the President, Treasurer and Membership Director are designated signing authorities and all have to sign bank documents if there is a change. At least two former signing officers should provide a letter to confirm a change as a result of the AGM election. The signing authority at ING Tangerine bank should be updated if necessary, 2 signing officers required. 1. Edits and publishes the Trekker 4 times per year on a set schedule. Each issue contains the Activities Report for 3 months. Thus the Winter Trekker covers January, February and March; the Spring issue covers April, May and June and so on. The aim is to have each issue in the members’ hands two weeks before the next Activities Schedule takes effect. Last date for submission is the 2nd Friday of the month before the issue is sent out, except for November when it has to be delayed until after the AGM. 2. Sends out a reminder to advertisers a month before submission date. 3. Seeks items for publication from the board and members. 4. Arranges the editing, compiling and printing of the newsletter. Assembling and editing takes about a week but some material will be submitted before the deadline. Most submissions are by email but some may be handwritten or require retyping; occasional submissions come by mail. Editing requirements vary – some items may require spelling corrections and others may need editing or formatting to reduce length to fit the available space. 5. Trekker assistant copies hike information from the calendar and pastes it into the Trekker pages. The pages are then sent asap to the editor for inclusion into the Trekker. 6. Sends a pdf file to proof readers. 7. After corrections are made sends a pdf file to the printer. 8. Collects a printed copy of Trekker from the printer for final proof reading. 10. Prepares invoices for advertisements and a list of such for the Treasurer. The membership director must be informed if there are new advertisers to ensure that they are included on the mailing list and receive a copy of the Trekker. 11.Liaises with the person responsible for sorting and mailing the newsletters. The team responsible for picking up, sorting and mailing the Trekker needs to be kept informed of the printing timetable since they will collect them from the printer. 12.Maintains an archive of past issues of the Trekker both hard copies and digital. 13.Serves as a member of the board. 1. Prepares a second version of the Trekker for website publication as pdf file can only be up to 2 mb; the pictures and ads need to be resized. 1. Standard features: - Header on front page is in green (this is done in bulk in a separate printing); otherwise printing is black on white. 2. Front and second last pages contain the same sort of information each time. 4. Front page: contains the logo and title and the identification of the issue. The names and phone numbers of the board of directors are shown. The president’s message is the main variable item – if necessary it can continue on an inside page. Also on the page is the association address, a request for submissions and the deadline for the next issue. 6. Last page: contains the return address, space for a address sticker and the postal agreement. 7. Inner pages: the arrangement is at the discretion of the editor but certain traditions are established. The second and next to last pages have traditionally been used for advertising and the same advertisers have had the same space for some time. Other advertisers seem to prefer, with half page ads, that their ad be on the outside edge of odd numbered pages. 8. Content: certain reports are in each issue, e.g. new members and donations prepared by the Membership Director. Others are fairly regular, e.g. trail development and trail maintenance. Most reports are from directors and may include items from Hike Ontario or developments affecting TVTA. 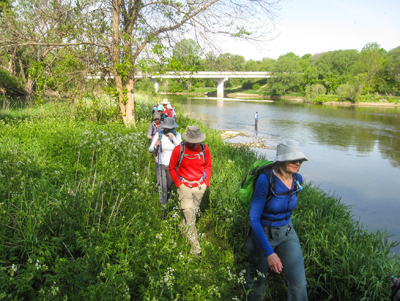 Reports on hikes and trips can come from any member or even from outside TVTA. 9. It may be possible to assemble a report on items of interest such as people completing end to ends. There may also be upcoming events to announce such as social events or closing of the Trail (Christmas Day). These reports are assembled by the editor. Reference to past issues indicates items that should be in a particular issue. 10. Within the first four pages a statement is required relating to Publications Mail. The policy is to accept advertisements that relate to hiking such as hiking trips, destinations and equipment. 1. Learn about the existing trail and its facilities such as signs and bridges. 2. Maintain maps and records of the existing trail infrastructure. Long term plans by city developers and other planning authorities. 2. Changes in land ownership. 3. Plan enhanced routing of the trail and side trails within the available resources. 4. Plan and prioritize construction of new facilities such as signs, bridges and boardwalks. 1. 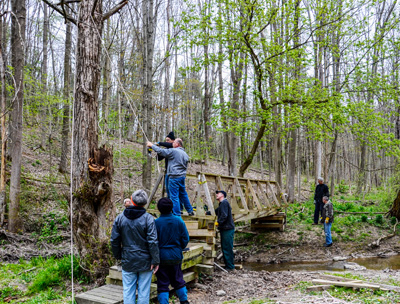 Consult with the Trail Maintenance Director & Trail Captains. 2. Maintain good relations with existing landowners and develop new relations where beneficial. 3. Keep a contact list of city and government stakeholders involved in land development and planning. 4. Communicate changes to the general membership. 1. Organize the addition of new facilities. 2. Prepare an annual budget estimate. 3. Attend the AGM and monthly board meetings. 1. Collect names, phone numbers, and e-mail addresses of new TM volunteers from the membership director. 2. Welcome new volunteers with a personal or phone contact to introduce yourself. Identify skills, abilities, and location preferences. 1. Send reminder to the trail captains to submit their annual Spring and Fall reports. 2. Review the reports and prioritise the recommended maintenance. 3. Forward requests for blazing and chainsaw work to the team leaders and other appropriate parties. 1. Assign leaders to cover small sections of the trail. 2. Suggest the TML’s organize 3-5 outings per year. 3. Recommend they recruit 1-4 volunteers for each TM outing. 1. Strive to comply with Hike Ontario maintenance guidelines. 2. Cell phones should be carried for contacting emergency services if required. 3. All maintenance workers must sign a waiver and be supervised by qualified team leader. 4. All power equipment must be used by experienced personnel wearing proper safety equipment. 1. Attend AGM and monthly board meetings. 2. Organize existing trail captains and trail maintetance leaders, update their contact information. 4. Assist in the recruitment of new volunteers to fill in missing positions. 5. Arrange for storage and maintenance of TM equipment and monitor the inventory. 6. Submit TM reports for Trekker. Thank people, generate enthusiasm, review what has been done, new plans, etc. 7. Present an annual maintenance report at the AGM. 8. Maintain copy of Bruce Trail (Hike Ontario) Guide for Trail Workers. 9. Keep records of trail maintenance for 7 years. 10.Ensure Incident Reports received are dealt with in a timely manner and retain. 10.Communicate with hike leaders as a group about board initiatives, requests, etc. 11.Liaise with Meet Up organizers. 12. Add 1 SMW to LEN calendar per month. 15. Assist other hiking clubs with advertising their hikes on our calendar. 1. Manage the day to day operation of the Meet Up site. 2. Contact TVTA “Open Hike” leaders to consider posting on Meet Up. 3. Post hikes on the Meet Up Site. “Hike leaders have the option of advertising on the Meet Up site. Hikes are posted only by the Meet Up Coordinator on the Meet Up site with the permission of the hike leader in question, and only after the hike leader has approved the content and wording of the posting. The hike leader will set an attendance cap. The hike leader is only identified in the posting by first name. No personal information is available to the Meet Up members or to the public at large. The Meet Up coordinator is to report to the Activities Director. 5. Encourage present TVTA hike leaders to participate in Meet Up advertised hikes. 6. Seek approval of wording of group emails from the Board of Directors prior to posting. A copy is to be kept on file by the Social Media Director - TVTA Liaison. 7. Regularly attend the 10 scheduled monthly meetings and offer suggestions and/or constructive feedback. 1. Interact with Meet Up members. 2. Promote hiking as a recreational and social activity. 3. Educate participants re: Trail Users Code, ESA restrictions, local trail locations, safe hiking practices, risk management. 6. Highlight the volunteer opportunities available with TVTA. 7. Encourage members to train and mentor hike leaders. 9. Recognize that the certified hike leader is responsible for the group and is the person in charge. 10.Seek solutions to problems by consulting with the Board of Directors. 11. Regularly attend the 10 scheduled monthly meetings and offer suggestions and/or constructive feedback. 1. Act as a technology resource and facilitator. 2. Provides assistance when needed by the board members who have admin access. 3. Encourages and facilitates site updated by members of the TVTA approved by the board. 4. Liaises with the membership director, Trekker editor, treasurer and guide book sales coordinator. 5. Board membership is optional but may be required to attend board meetings as per board’s request. 6. Provide a yearend report at the AGM which includes statistics such as number of online payments, online accounts, site visitors, Twitter and Facebook followers. The following is a list of information that must be tracked and handed over to the next person who fills the position. In the absence of a successor the information must be handed over to the president and secretary. Successor reviews contact details on registrar site and update as required. Incumbent contacts sales and support to update contact information. Successor reviews contact details and updates as required. 1. Regularly attend the 10 scheduled monthly meetings and offer suggestions and/or constructive feedback.